In 2008, the Open Handset Alliance announced the Android platform and launched a beta program for developers. Android went through the typical revisions of a new platform. Several prerelease revisions of the Android Software Development Kit (SDK) were released. The first Android handset (the T-Mobile G1) began shipping in late 2008. Throughout 2009, more Android handsets and diverse types of devices powered by Android reached world markets. As of this writing, there are more than 36 Android phones available from carriers around the world. This number does not include the numerous Android tablet and e-book readers also available, nor the dozens of upcoming devices already announced, nor the consumer electronics running Android. The rate of new Android devices reaching the world markets has continued to increase. In the United States, all major carriers now include Android phones in their product lines. Google has been a contributing member of the Open Handset Alliance from the beginning. The company hosts the Android open source project as well as the Android developer program at http://developer.android.com. This developer website is your go-to site for downloading the Android SDK, getting the latest platform documentation, and browsing the Android developer forums. Google also runs the most popular service for selling Android applications to end users: the Android Market. 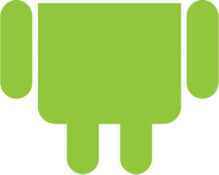 The Android mascot is the little green robot shown in Figure 1.1. Google has hosted several contests, called Developer Challenges, to encourage developers to write Android applications. The first two rounds saw $10 million in prize money awarded!